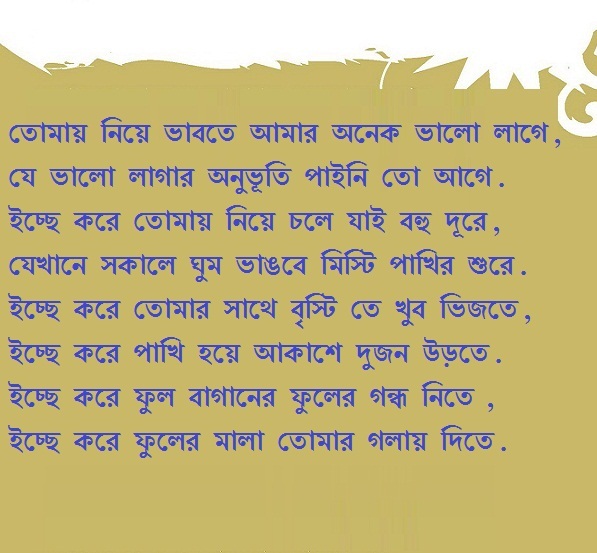 In this post i have written some bangla valobashar kobita as known as love poem. 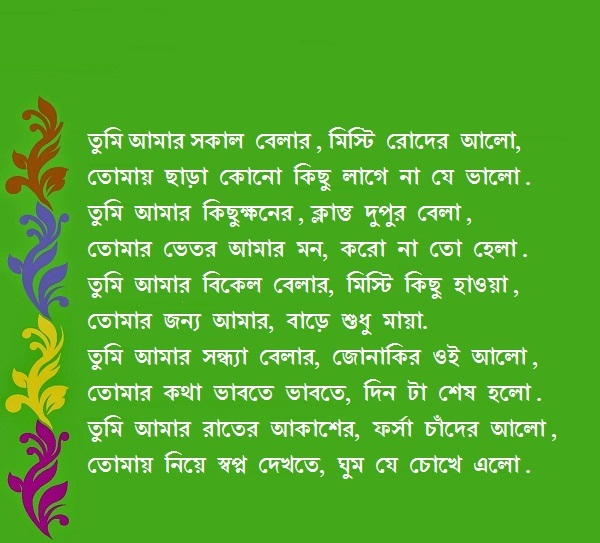 I have searched for some nice bengali valobashar kobita or bangla love poems but not got the satisfied result. For this issue, i decided to write some romantic bangla love poem or valobashar kobita and Rabindranath tagore poems in bengali. 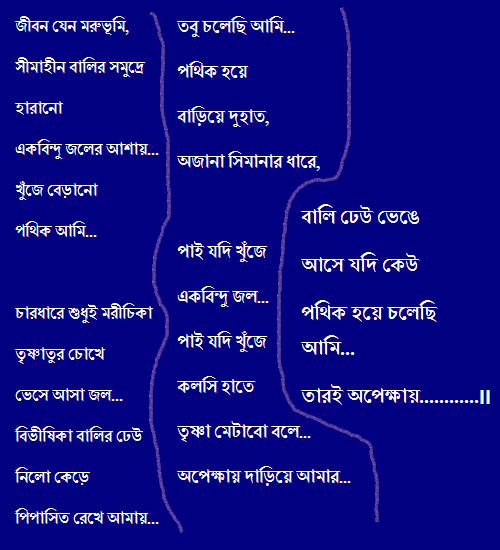 Here you will get many sad love romantic bangla love poem and valobasar kovita. From these poems or kobita, i have written some with my own hand and imagine. Try our Bangla Premer Kobita. Here all poems or kobita written with english but bengali. If you read the poems one by one, i think you will enjoy best. All poems are written and edited with my best practice. Even, you will get any issue, please inform us, i will try to fix that as soon as possible. Bengali Love poems. You will get here some poems with best images and wallpapers. So you can share the images with your best friend or lover. 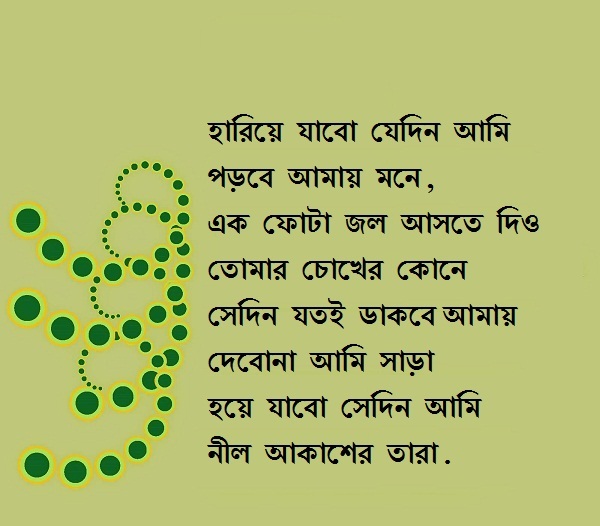 So enjoy your life with the best bangla love poem or valobashar kobita or premer kobita. Je valo lagar onuvuti paini to age. jekhane sokale ghum vangbe misty pakhir sure. Icche kore pakhi hoye akase dujon urte. Icche kore fuler mala tomar golay dite. sei theke mon ta amar tomay pete chay. Mone hoy amar kache tumi onek dami. tomay chara kono kichu lage na je valo. tomar vetor amar mon koro na to hela. tomar jonno amar bare sudhu maya. tomar kotha vabte vabte din ta sesh holo. Tomay niye sopno dekhte ghum je chokhe elo. Pakhider sathe sathe ghurte chay batase. ochin deshe jabo korbe na keu mana. Tobe tumi shur milao pakhir misti gane. Tobe tumi monke vashao meger velay. Tobe tumi hariye jao oi tarar melay. Tobe tumi Chupi chupi janiye diyo tomar isharay. Jokhon Tumi Sudhui Royecho Amar Deho Jhure! !